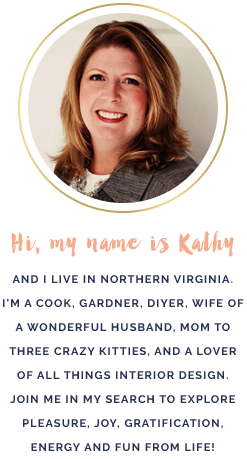 When the weather turns cold, my canning habits often turn from boiling water bath to pressure canning. I know some people who freeze all their summer fruit and specifically wait to make jam or jellies in the winter when it's chilly outside and heating up a big, pot of boiling water sounds divine. Thanksgiving gives me the perfect opportunity to make a batch of turkey broth, which can also be used in recipes that call for chicken broth. I often make soup with the turkey carcass, but sometimes you are ready to eat something different after 5 days of turkey leftovers! So, turkey broth it is! 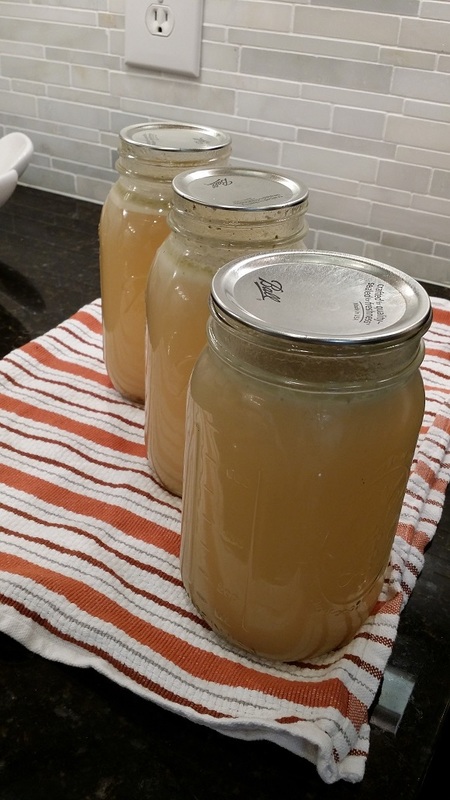 My chicken or turkey broth is often made different ways, depending on time and convenience. If I'm REALLY starting from scratch, I'll roast the vegetables and poultry pieces/parts first in the oven, then throw it all into a pot with some water and spices/herbs and simmer for a few hours. In the case of a leftover turkey carcass, I just throw it into a pot with some cut up veggies (carrots, onions, garlic, whatever...), add water, some peppercorns, a couple of bay leaves, and let it simmer away. So, there really isn't a recipe per se, but turkey or chicken broth DEFINITELY has to be pressure canned for safety. 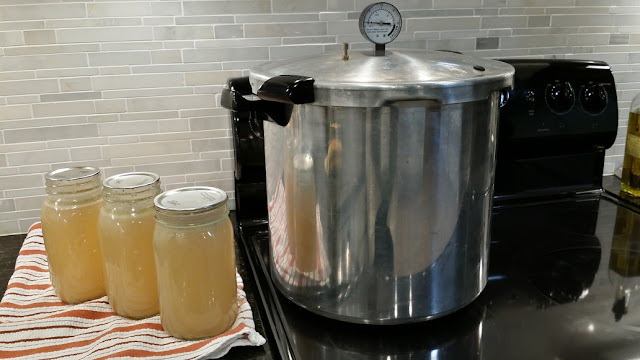 The biggest tip I can give you regarding making turkey or chicken broth is to let your broth cool over night in the refrigerator so you can skim off any congealed/hardened fat floating on top of the broth before reheating and canning. I didn't do this with this batch and 3 of the 6 quarts that were produced did not seal. This is due to the fat/grease getting under the lid and preventing a solid seal from happening. So, that means I have 3 quarts of turkey broth in my refrigerator waiting to be made into something. Looks like soup will be on our menu some day this week!.